Winning marketing campaigns successfully surf the wave. The message goes further with less effort. Marketing campaigns aligned with the news, increase the odds of getting picked up by the press and earned media. How can this be done quickly when the news cycle changes daily? Multi-media digital stories offer an affordable, easy-to-use solution. They can easily be customized so your core marketing message is relevant to current events. The Voter Participation Center (VPC) helps Americans register to vote with a special focus on theRising American Electorate of unmarried women, people of color, and millennials. Since 2003 VPC has helped register nearly four million American voters. VPC launched an awareness campaign recently before National Voter Registration Day to leverage the press awareness around the event to reach more potential voters. The plan was to create an innovative, digital story with information on voting regulations and timelines that would be news-worthy. Here's how VPC and DemLabs executed the project in four days using StoryMaps software. VPC prepared a database of voting requirements and deadlines by state. 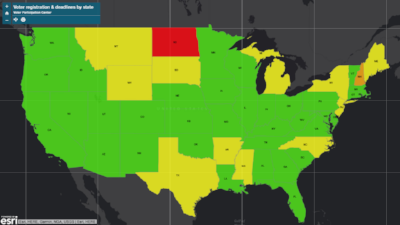 This info was uploaded to ArcGIS Online (Esri’s Cloud-based location intelligence platform) to create an interactive map. Clicking on a state reveals further details. These digital maps are evergreen and can "surf multiple waves" depending on the program. VPC map here. 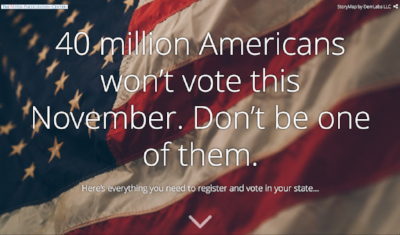 A tag line aligned with the National Voter Registration Day was chosen to maximize the chances of press coverage. We used a free image from Unsplash for the cover page. Pixabay and Pexels are two other valuable sources of free stock photos. The link to StoryMap is a URL that is easy to share on social media. StoryMaps incorporate text, images, maps and videos that make the story more compelling. 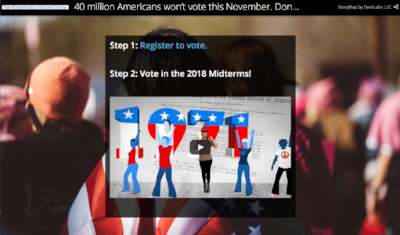 A link to Rock The Vote encouraging people to register was included as well as a video explaining the history of voting rights and the importance of voting. It's important to credit the source of the information used. Story maps are easily adapted to emphasize different issues or storylines, even while preserving your call to action. This story map shows the approach. 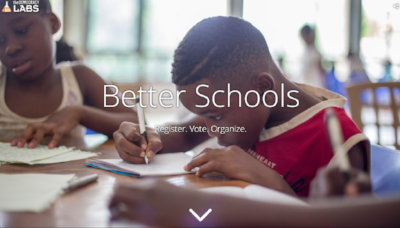 It has the same underlying theme about the importance of voting, but the lead in is the need to vote to get better schools. It includes an NEA video on the value of public education. BerlinRosen is a national leading national public relations and strategic communications firm that advises VPC. They generated press coverage for VPC through this story map with media outlets including NBC Universal and Fox19 Now. Contact us to learn how to use story maps to catch the 'news cycle'.